Just Peachy Functional Nutrition. Integrative Wellness. When fresh local peach season rolls in you know summer is at an all time high. Consider the soft skin, juicy goodness and sweet aroma a fresh peach offers. These beauties in season are truly something I look forward to each August. This year I was so enthralled by some locally grown peaches at a farmer's market, I bought a case. Freezing them was super easy (recipe below). My friends and family can expect me to be the bearer of peach desserts for the foreseeable future. I don't think I'll hear any complaints! 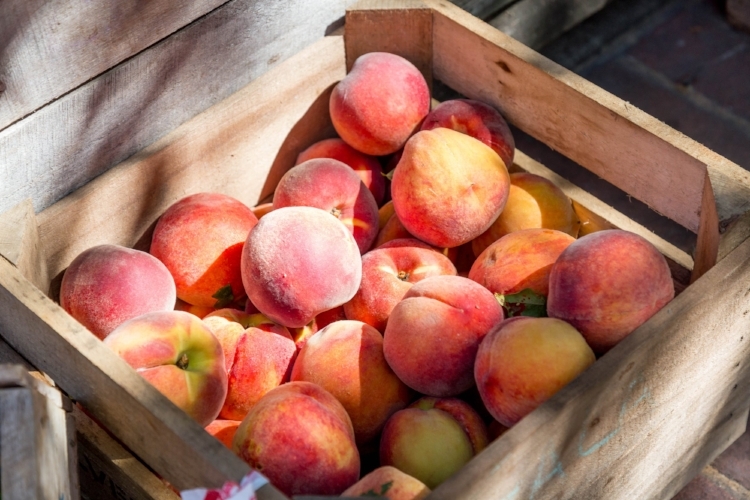 Tip: Choose certified organic peaches to assure they aren’t pesticide/chemical sprayed. Peaches and cream: Modernize this tradition with Ree Drummond's whipped coconut cream. Peach Cobbler: Use Tam's berry cobbler recipe. It's free of gluten. Just substitute peaches. Omit sugar with the fruit. It's free of gluten. Peach and Greens Salad: Top your favorite salad greens with sliced peaches, goat cheese, fresh grilled salmon and Martha’s honey balsamic vinaigrette. Peach, Basil and Tomato Salad: The epitome of summer. Drizzle with a little champagne vinegar and olive oil. In a lunch box. Despite their thin skin, peaches travel well. Refrigerate the night before, pre-slice and include a fork to make sure chin dripping juice isn’t an issue at school or work. 1. Rinse them well under lukewarm to cool water and gently dry the fruit. Their skin is delicate so be careful to not break the skin. 2. Choose a baking pan that will fit flat in your freezer. 3. Line the baking pan with parchment paper. 4. Slice the peach into halves, quarters or eighths discarding the pit. 5. Line the pan so the peach slices do not touch each other. Cover with parchment. 6. Freeze a couple of hours, as long as overnight but not too long that they get crystals. 7. Fill a quart size bag that you can seal without air. I recommend a ‘seal a meal/food saver’ to completely remove air and minimize freezer burn. Weigh and measure portions if you desire it for recipes. 8. Label the date and contents/amount and freeze. Pop back into the freezer. Thaw in the refrigerator when you are ready to use. Peaches contain vitamin A and beta carotene (beta carotene converts into vitamin A inside the body. Rutgers goes on to say that “vitamin A rich fruits are known to offer protection from lung and oral cancers. They contain many vital minerals such as potassium, fluoride and iron.” Other benefits Rutgers cite include flavonoid polyphenolic antioxidants including lutein, zeaxanthin and beta-cryptoxanthin. In short, these compounds protect against oxidative damage your body may incur as part of life. Healthy aging is a life- long process which peaches contribute. Uplift your food life by replacing myths about eating healthfully and how to navigate choices. Healthful yet good is tricky until you know how to do it wisely. The book is a wellness tool to personalize your food life. With 19 real All-American recipes free of gluten big people and little people love.